The Philippines is a popular destination for foreigners seeking adventure, history, cultural and recreational activities and white sand beaches. Even the locals are going out of their comfort zones to explore cities they’ve never been before. There are so many things to do and places to see in this beautiful country in the pacific. From historical places to underground rivers, you will not leave disappointed. One of my favorite places in the Philippines is Cebu. The Island of Cebu has a lot of history. 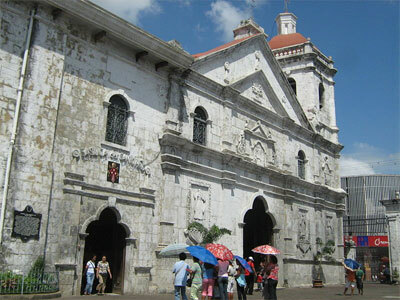 It is known to be the oldest city in the Philippines. Some of the attractions to see in Cebu include: the Magellan Cross—it symbolizes the birth of Christianity in the Philippines (500 years old), Fort San Pedro—the oldest and smallest fort in the Philippines, and Basilica Minore del Santo Nino—the oldest Christian church in the Philippines. There are other attractions in the nearby area, such as the famous Chocolate Hills in Bohol Island. The nearly perfect rounded hills look like chocolates in the middle of the dry season because of their brown color. There are hundreds of them and they all look uniform in sizes. It is one of the best natural settings I’ve ever seen. There are also beautiful beach resorts where you can relax and enjoy the scenery or take an adventure under the sea and go scuba diving or snorkeling in the shallow end and appreciate the colorful reefs. Another must-see sight is the St. Paul Subterranean River National Park in Puerto Princesa, Palawan. Located in the northern coast of the island, the 8.2km of underground river is believed to be the longest in the world. You can take a tour of the river—goes for about 1.3m. One outstanding feature of the river is that, it flows directly to the South China Sea. The underground river is one of the United Nations World Heritage Sites. The rock formations inside the cave are truly spectacular. They’re huge. I’ve never seen anything like it. It’s quite an experience. The Philippines is loaded with adventure opportunities. It’s hard to imagine anyone leaving this magical place not being fully satisfied.